Engage all your senses in beautiful Provence. World-class art and architecture, enchanting local markets, charming bistros, a stunningly diverse landscape, and romantic views around every corner—France is a traveler’s dream. France boasts Old World elegance and stunning natural beauty. From the romantic winding streets of Paris to the redolent lavender fields of Provence and the soaring peaks of the Alps, there’s a dizzying array of breathtaking sights in this iconic destination. With memorable landscapes, cultural riches, and extraordinary historical sights on the itinerary, VBT’s walking tours and bike tours in France are enchanting and invigorating. The French countryside is varied—but invariably beautiful. Nestled in the rolling hills of the Alsace Wine Route are stunningly preserved medieval villages and historic vineyards producing world-class wines. Normandy and Brittany offer breathtaking shorelines heavy with historical significance. The Loire Valley features magnificent castles with manicured gardens, and the soaring Alpilles provide an arresting backdrop to the cobbled streets of Provençal villages. 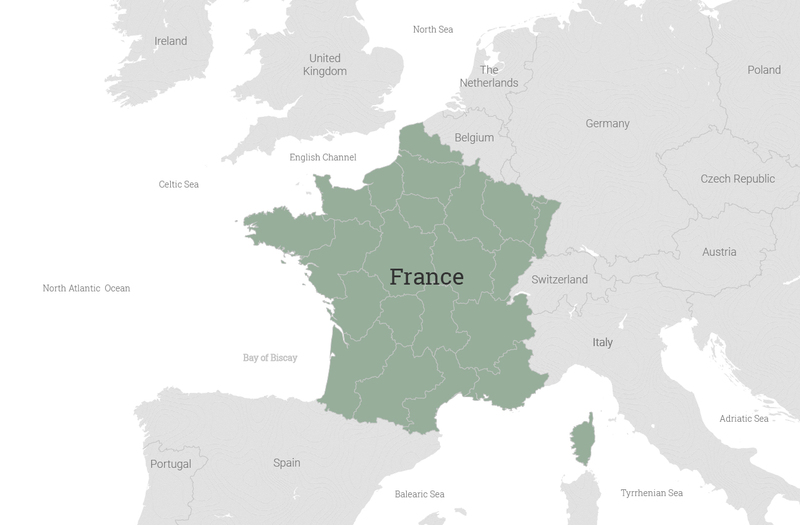 Throughout the many regions of France, you’ll revel in the warmth of the French people, whether chatting with locals over fresh produce in a charming marché, playing a light-hearted game of petanque in Burgundy, or sampling fresh huîtres, or oysters, with a local fisherman in Cancale. No walking or bike tour in France would be complete without a deep dive into the country’s exquisite cuisine. From the simple pleasure of a crusty baguette from the boulangerie to a gourmet meal in a Michelin-starred restaurant and champagne tastings at ancient vineyards, foodies will discover endless culinary delights. Be tempted by the smells, flavors, and goods of the sprawling Vaison la Romaine outdoor market. Imagine the colorful history of King Henry II and Catherine de Medici at the Château de Chenonceau. Food and wine are central to the French way of life. Meals are lengthy and purposeful, with plenty of time for socializing and savouring. From buttery croissants and gooey pain au chocolat from the corner boulangerie to markets overflowing with local produce and artisan cheeses to Michelin-starred restaurants with world-class wine lists, you’ll experience French culture with every bite you take here. Over the centuries, France has cultivated an incredible art scene and produced an outsized number of revolutionary painters. Throughout France you can see works by the great masters in museums and galleries, as well as the breathtaking settings that inspired them. Monet, Manet, Degas, Rousseau, Gauguin, Cézanne… the list of big names that left huge impacts on the art world throughout history goes on. On June 6, 1944, Allied troops landed on the beaches of Normandy to begin a crucial operation to liberate Europe from German military occupation. Today, this storied coastline is a quiet, beautiful reminder of a turbulent past. Travelers with an interest in military history can stand on these sands and visualize the dramatic events that came to pass on D-Day. To truly discover Alsace you have to take time! Breathe while you cycle through vineyards, listen while you cross a charming village, and most of all take every opportunity to meet the local people. A five-year veteran of VBT, Jean loves to introduce travelers to the unique culture, history, people, food and climate of Alsace. France is the best place to cycle! There’s a great variety of recent and ancient history, scenery, local culture, and traditions. Bruno has lead VBT adventures for more than 20 years! He has traveled all over France and loves to introduce guests to the history, cultural differences, food, and customs of his country. Slow down to experience all of the flavors of Provence. Stéphane has been a VBT leader for over 10 years. A native of France, he grew up spending summers in Provence with family and knows the best places for delicious, fresh food and great wine. Experience the best France has to offer in the way of scenery, towns and villages, food, people, and history. Sophie has lead VBT adventures for almost two decades. As a native of France, she has traveled extensively throughout the country. Guests benefit from her knowledge of the history, beautiful landscapes, friendly locals, and good food of her home country. The trip through Normandy and Brittany was beautiful, historic, and fun! It was the perfect mix of biking though the country, visiting historic sites, and enjoying special treats along the way. Our guides Luc and Kevin were outstanding! This trip was better than anticipated. We expected a great time, but this was outstanding in service, leadership and bike friendliness.